Auxiliary Bishop Douglas Deshotel was presented with his own personal Fr. 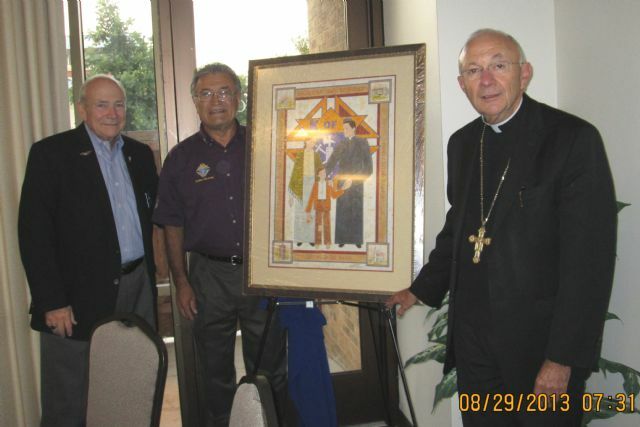 Michael J. McGivney Icon at the August Dallas Diocese Chapter meeting by Diocesan Deputy Roger Scott and Dallas Diocese Chapter President Isaac Sandoval. The year 2013 marks the 13th anniversary of service to our Order by our 13th Supreme Knight, Carl Anderson. Also in 2013, Texas hosted the Supreme Convention in San Antonio and reached 100,00 Knights in Texas. To mark these achievements, Texas commissioned a special new icon of our founder, Fr. McGivney. The icon shows Fr. McGivney comforting a widow and orphan. Each corner shows a key site significant to our Order. Each Texas Bishop will have been presented with his own icon by his respective diocese Knights. Next PostNext How Do Your Charity Assessments Help the Deaf and Disabled in Texas?